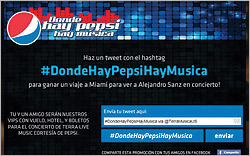 As part of its renewed Hispanic marketing efforts under its new “Viva Hoy” platform, Pepsi is one key sponsor of an Alejandro Sanz concert to be live-streamed internationally on Dec. 6 by Terra Live Music. The event will mark the first time that Pepsi’s U.S. Hispanic and Latin American marketing teams have worked together on a cross-border initiative, Javier Farfan, senior director of cultural branding for Pepsi, tells Marketing Daily. It also marks the first time that Pepsi as a whole has sponsored a live performance across borders. Like other Terra content, the HD concert will be offered in English, Spanish and/or Portugese, and viewable across multiple screens/devices, including PCs, tablets, smartphones, smart TVs and DOOH screens -- and will offer viewers a variety of social and other channels through which to interact and share about the event. The event, the first time an Alejandro Sanz concert has been live-streamed, is also being sponsored by American Family Insurance, Kia and T-Mobile. Bestselling Latin music artist Sanz is among the most influential Hispanic social media influencers, with some 7.7 million Twitter followers and nearly 2.4 million Facebook fans, currently. Pepsi is promoting the live-streamed concert on its Spanish- and English-language site, MiPepsi, as well as MiPepsi’s Facebook and Twitter presences, reports Farfan. For Pepsi, the concert sponsorship is an important step in extending its renewed Hispanic marketing focus beyond the U.S., to Latin America in particular, says Farfan. Pepsi’s “Viva Hoy” platform -- a translation of the overall brand’s new “Live for Now” marketing platform -- reflects Latinos’ higher-than-average consumption of carbonated soft drinks, as well as Hispanic population growth trends. Pepsi was among Advertising Age’s top 50 Advertisers in Hispanic Media from 2004 (when it was #6, with $68.5 million in spending) to 2007 (#27), but it dropped off that list thereafter. This past July, Pepsi kicked off its multiplatform “Viva Hoy” initiatives with -- among other efforts -- a TV spot featuring Argentine soccer player Lionel Messi, aired on both general media and Hispanic networks. The Sanz concert sponsorship is also representative of the digital initiatives that will be key in Pepsi’s overall, global, multicultural “Live for Now” marketing approach going forward, notes Cesar Sroka, group account director for OMD, which is part of a cross-agency, multi-disciplinary team of Omnicom agencies working on the “Live for Now” global campaign.